Okay so where do I start? Kudos for cover-intrigue qualities are a given so that would be one of the reasons I went for it. Our main character Rhine (whose name took some getting used to) is living in a crumpling world where girls don’t live pass 20 and men 25. Unfortunately for her she gets taken away to start this new life in keeping the human race alive. Throughout the story we come to know her beloved sister-wives who were as good as they were questionable, they weren’t the wicked step-sister in Cinderella, but they lacked the same fight Rhine did despite having been placed in the same predicament, as we dig more into their own personal lives you come to understand why they are how they are and irritation fades into pity and perhaps mutual understanding. Also we mustn’t forget the lucky groom to these ladies (god knows I tried), whom I constantly had to remind myself is at least 22 or so of age (I believe it’s mentioned but I’m blanking) and not some 50-something year old man. His character was oozy sweet, meaning that if he was this tyrant of a man doing what he wills I could deem him as the bad guy but once more learning about our dear Linden you see that he too is in a similar situation as Rhine (although his strings are being pulled by someone else and he is oblivious to that fact). And yes there is a bad guy, and he is this sickening-slimy beast of a being whom I would gladly end his life (but isn’t that how it always is with the bad guy? I realize I haven’t said too much about our little heroine, except that never wanted to allow myself to get sucked into a book so badly only to shake and perhaps slap the MC. Its only because she starts off so strong, quick-on-her-feet and independent alongside her brother whom she would die for (and he likewise) that as soon as she gets kidnapped that she converts into this vulnerable and hopeless lamb whose way or thinking is “well this isn’t so bad I should try and make the best of things”. Through her emotional roller-coaster of “should I leave or should I stay” I must say (to keep myself from going off in some flamboyant rage) I had to find some empathy. However, we learn that the house (pshh more like mansion) she lives in holds dark disturbing secrets and once she discovers them Rhine is quickly revived with a more determined and dare I say more cunning (snake image imprinted) girl. Also if you are a romance-dweller like me, this book dose provides that pinch of fluff for Rhine and her loyal servant Gabriel. (Insert Rhianna’s song “We Found Love”). Next since this is a trilogy the adventure is far from over. Naturally our paring do plot to escape but as to what awaits them beyond the ‘safe’ confinements of the mansion’s wall is not going to be daisies and waterfalls. It is slow pace at the beginning but only because there are crucial information and shouldn’t be tossed aside to only be introduced in the final book (yes I have seen that happened and it leaves me with a huge WTF) but once Rhine realizes that she is better off in the real world rather than a fake one…the suspense of how she gets out keeps the page turning. At times it can get depressive but what do you expect from a world with a virus killing everyone and with no cure being found? Now with the second released my hands are already itching to get on it. 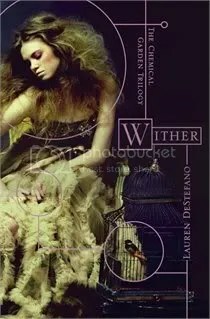 This entry was posted in 2012, Reviews and tagged Book Reviews, Books, Dystopian, Fantasy, Lauren DeStefano, literature, Meli, Romance, Sci Fi, Tangy Marvels, The Chemical Garden Trilogy, Wither, Young Adult by dreamingwithink. Bookmark the permalink. I’m interested to see whether DeStefano will go into more detail about how the virus works, where it came from and if there are any possible cures. While you wanted to slap Rhine, I wanted to slap the author because of the soft science! But I guess I read this book for pleasure, without expecting much in the way of hard-core science, so I have no one but myself to blame.